When, after spending three months in the United States, I returned home postroynevshey 5 kilograms, friends looked at me in bewilderment, they say, whether I lived in the States, or lied, and she meanwhile was hiding underground. After all, in America it decided to eat unhealthy foods (unhealthy food) and plump (gain weight). When I said that it happened with the help of a healthy diet (healthy diet), friends felt sorry for me, drawing in the imagination, as I like herbivorous koala, every day tasteless chewing grass. The only way to keep health — eat what you do not like, drink what you do not like, and do what you do not want to do — said Mark Twain. I beg to differ with the great author. Healthy eating — is not eating salads for breakfast, lunch and dinner, and not skipping meals (skipping / missing meals), and the understanding of what action has food for the body, what foods (products / foodstuffs) should be eaten on a regular basis and which use extremely rarely or not at all rule out (exclude) from the diet. Let me tell you a secret: not to recover the country’s fast food (fast food), and obese (obese) people is very important to read the labels on the products (read food labels). Let us consider an example of them. So, read any «label», more nutritional value (nutrition facts), you should pay attention not only on the expiry date of the product (expiration date), but also in the list of ingredients (ingredient list). They are listed (listed) in descending order of the number that are included in the product. In the first place are the main ingredients. That is, if we buy the meat product, the first in the list should be meat. Then pay attention to the serving size (serving size). 1 cup — the size of your fist or palm of your hand (as you more convenient to measure). Servings per container — is the number of servings in the package. The average person needs 2,000 calories a day, physical activity — 2500. Anyone who wants to lose weight (lose weight), should be reduced (cut down) the daily intake by 500 calories, but it should not be less than 1500. With these «comrades» are all pretty simple. The main thing — to know their daily rate. The person needs 50-60 grams of protein (protein) per day and 300 grams of carbs (carbohydrates). From this and repels. Do not forget o cellulose (fiber) (25 grams), which helps the digestion (digestion). With regard to fat (fat) (not more than 65 grams per day), they are divided into useful (unsaturated (unsaturated)) and harmful (saturated (saturated fat) and trans fats (trans fat)). Also do not forget about cholesterol (cholesterol) and sodium (sodium), the use of which is limited to 300 and 2400 mg, respectively. Naturally, frantically counting program — not an easy task. There is provided another column — daily rate (daily values), which helps us, mere mortals, not nutritionists who studied at (nutritionist / dietician), to understand how much cholesterol as a percentage of the daily value contains this one donut. Another great section on the label — is a list of vitamins (vitamins) and minerals (minerals), contained in the product. Well, if in the product of more than 10% nutrient (nutrient). 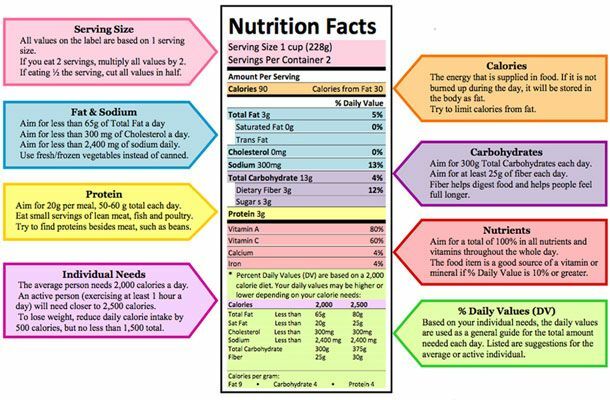 In general, reading food labels — is very educational lesson. In the US, such detailed and standardized labels became mandatory in 1990 for those foodstuffs that have undergone processed (processed foods). The US government has realized that people are missing in supermarkets all that comes to hand, because of the abundance Pestryaev the labels. American Experience take over many other countries. For example, when moving to Slovakia in the first few months I have had difficulties with the purchase of products due to ignorance of the language. Saved me is that most of the labels does not differ from those that I have seen in America. And without translation everything was clear. I hope my experience will help you. And if you feel that buying products abroad, you still do not have enough vocabulary, then check out the article «Food in English». I suggest you do the exercise, to check how well you have learned the word. English by Skype: serious work part-time or temporary?